Zinedine Zidane replacing Jose Mourinho as Manchester United manager could end up being very bad news indeed for one player in particular: Alexis Sanchez. CaughtOffside understands the former Real Madrid manager has never really rated Sanchez as a player and is understandably even less impressed with him now after his struggles at Old Trafford. The Chile international has scored just three times since joining United from Arsenal, looking a shadow of the player who set the Premier League alight for much of his Emirates Stadium career. While current United manager Jose Mourinho continues to show trust in Sanchez, sources close to Zidane have told CaughtOffside that the player would be unlikely to feature in the Frenchman’s mans if he were to take over. It remains to be seen, of course, if Zidane will land the job any time soon, though CaughtOffside have previously been told the 46-year-old has communicated with some United players about being confident of getting an offer in the near future. The Red Devils’ form has improved since then, so talk has died down to an extent, though various stories keep emerging about potential transfer targets for the club under Zidane. Don Balon have claimed he’d want to sign Chelsea duo N’Golo Kante and Eden Hazard, the latter of whom could be an ideal like-for-like replacement for Sanchez in attack. Diario Gol have also linked Zidane with demanding the signing of Neymar from Paris Saint-Germain, while CaughtOffside have also been told that he’s discussed potentially signing Antoine Griezmann. It is little surprise then that sources close to the coach are claiming Sanchez wouldn’t be in his plans, which most likely points to an exit from Old Trafford. In truth, many fans are starting to question the former Gunners star after his struggle to settle, so it might well be that figures at the club would also think seriously about cashing in on him while they still can before he ages or his reputation simply suffers further. That said, given how ambitious a deal it was to sign Sanchez at the time, the board may be keen to give this one more time, so it just remains to be seen how much of an issue this might be on both sides with regards to Zidane possibly coming in at some point in the future. 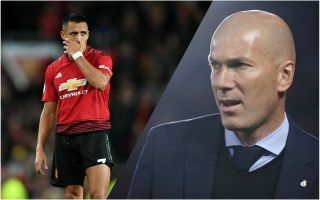 This would not appear to be the first time Zidane has expressed reservations about working with Sanchez, with Don Balon claiming earlier this year that he vetoed his signing for Real Madrid in January.